Recently a number of our customers have been duped into buying SCART to HDMI converters of Amazon because of their apparent value for money, sometimes in the region of £20. But unknowingly for them these cheap boxes don't support RGBS/RGB video. They claim to upscale all kinds of screen resolutions to 720P and 1080P but upon closer inspection they only accept a CVBS signal from the SCART input also known as composite video. Which is no good when you want to use an RGB SCART cable. So I decided to compile a list of converters that found which don't support RGB, thus to be avoided. Here are just a few I found on Amazon.co.uk. 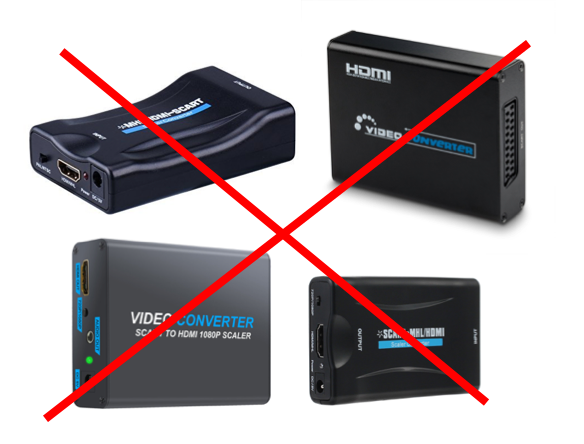 Some SCART to HDMI converters look similar to each another as they are probably rebranded converters from the same factory. If you have found a converter not on the list above and you are unsure whether is RGB compatible just do a quick "Find" command in your browser, CMD⌘ + F for iMac or Ctrl + F for Windows. And type in "RGB". If it comes back with 0 matches then avoid that converter. If it comes back with a number of matches just check where the RGB text is on the webpage, as it maybe for another product in the "Sponsored Products Related To This Item" section of the webpage, in which case it doesn't relate to the converter you are looking at. Make sure that the RGB text is in the Product Description for the converter you wish to purchase. A proper RGB SCART to HDMI converter will set you back at least £40 to £50 on average. If you want to know my personal recommendations for connecting your retro consoles to a modern television then please read my article on how to hook up retro consoles to High-Definition TV's via HDMI.